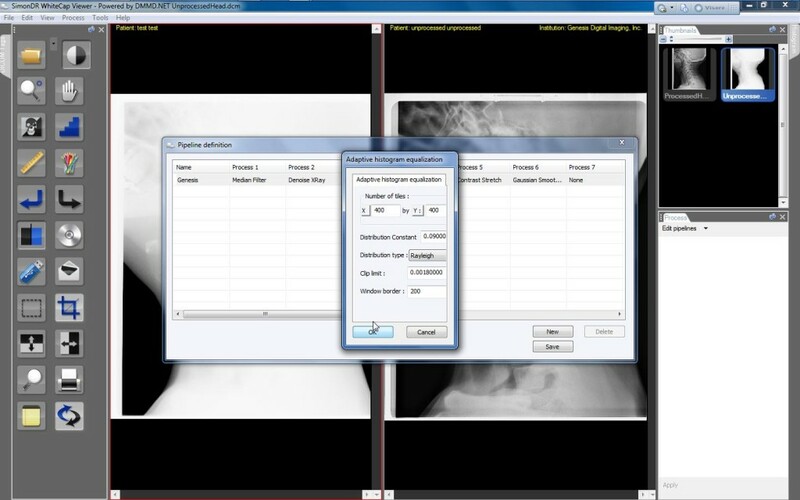 Visere Medical provides several different algorithms for enhancing medical XRay images. I will discuss several of the filters available to Visere Medical and what their effect is on the output of the final image. 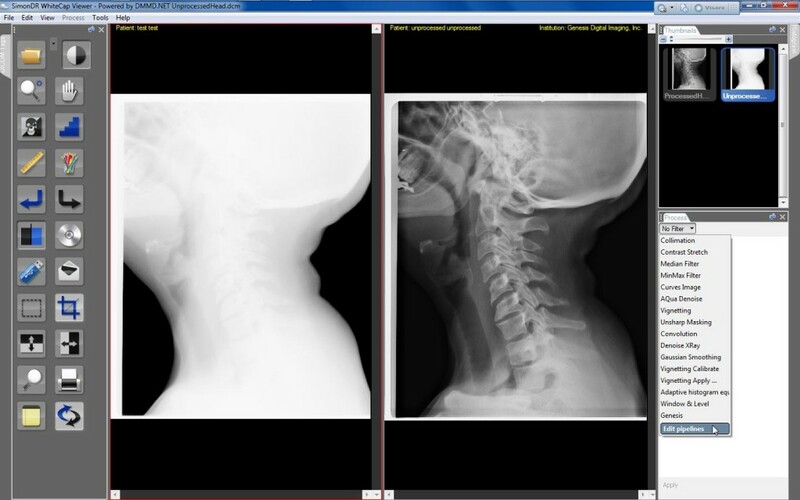 You can evaluate these algorithms with your own images by downloading a copy of our Visere Medical Viewer software or you can download a copy of our Medical Photoshop Plugin. The discussion in this blog assumes that you are using our free Visere Medical Viewer. To access all the filters available within the Visere Medical application (also called WhiteCap Viewer) you need to enable the Process Toolbar. This is done by clicking on the Process menu item. The Process toolbar starts off un-docked and it can be moved around or docked by simply dragging it to the desired location. Once the Process toolbar is visible, the list of available processes can be accessed by clicking the down arrow in the upper left corner of the toolbar. Of all the available filters, a few of them are discussed next. The most versatile filter is the Pipeline Filter. The Pipeline filter has the ability to create new filters by stringing together a list of existing base filters. The pipeline filter can be used to define different pipelines, which can use different lists of filters, or the same list of filters but with different settings for each of the individual filters. 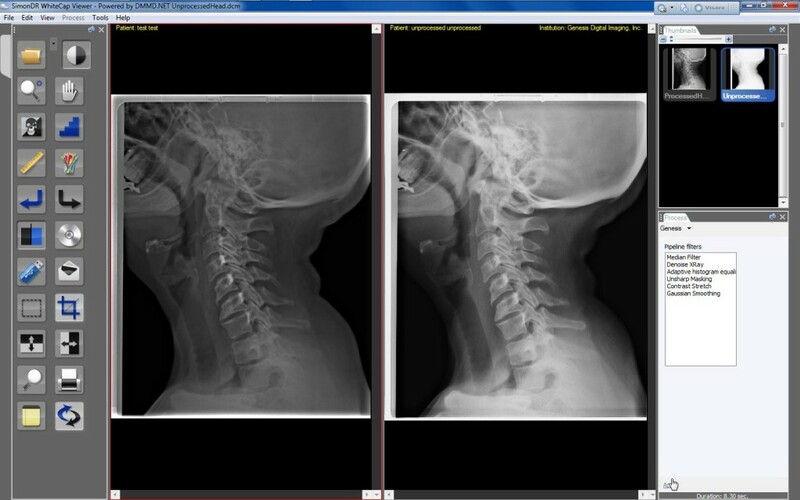 Open up the two images side by side, with the unprocessed image on the left and the 3rd party processed image on the right. From the Process window select Edit Pipeline. A dialog similar to the image shown below will pop-up. Press the New button and a new entry titled Pipeline Name will appear. Double click on the cell with the Pipeline Name and enter the name of the new pipeline. In our example, the name used for this pipeline is Genesis. Up to 20 processes can be stringed together to generate a new pipeline called Genesis. Each of the individual filters can be edited by clicking on the three points button [...] and the individual configuration dialog will open as shown. In the image below, the example of Adaptive Histogram Equalization configuration is shown. After all the filters are selected and configured, click OK to save the pipeline. In the process list, the new pipeline will now be listed, just above the Edit Pipeline filter. In this case, the new entry is Genesis. Select the new process — Genesis. When the process is selected a list of all the different filters that are part of the new process is shown. This allows you to confirm that the pipeline is indeed properly defined. The pipeline can be edited at any time by going back to Edit Pipeline. Make sure that the active window is the window on the left (the raw image) and then hit the Apply button at the bottom of the filter. The process is then applied to the left side image and the results are shown once the process is complete. For processing XRays, there are a multitude of options, but some processes are more useful than others. The median filter is good for salt and pepper noise, as we’ve discussed it here. In the current implementation we only process windows of sizes 3×3. This is intentionally enforced for reasons of speed and because larger windows can create too much of an edge shift in the final images. Since we are interested in only removing the strongest noise, the default of 3×3 seems to be good. XRay Denoise is a more advanced version of the median filter. Unlike the median filter, this filter analyzes each pixel in the image and modifies it only if the algorithm considers it a noisy pixel. This tends to minimize the amount of correction and most importantly, eliminates the edge shift, usually introduced by median filtering. The filter is mostly recommended for sensors that have a few bad pixels. This filter removes White Gaussian noise, as discussed here. Do not use a windows size larger than 3, otherwise the filter will be VERY slow. This is a problem in the current implementation of the filter. In the future we will optimize the filter for larger window sizes as well. Thus, leave the window size at 3. The first parameter, Sigma, is the level of noise. Use a noise level of at most 15. Using anything higher than 15 tends to denoise the image too much and since the image denoises local patches, too much denoising manifests itself by introducing “blocky” regions in locations where there might be less noise. This filter is DMMD’s most effective filter for enhancing image contrast. Window and Border Size: The overall image is broken up in regions that are Window Size large and histogram equalization is applied to each region independently. Since the regions are independent, this can potentially introduce border artifacts. To minimize these border artifacts, the Border Size controls the amount of overlap between neighboring patches. Thus, the histogram equalization patch size is Window Size plus Border Size, with Border Size overlap. Distribution Type: In the Histogram Equalization blog we discussed how the re-mapping of the pixel values can be done such that their distribution (or the cumulative distribution function) can look like any desired distribution. Currently, the algorithm has three different distribution types. Experimentation with each distribution type is highly encouraged! The performance of the filter can vary significantly from one distribution type to another. Distribution Constant: this is a constant value used for controlling the distribution spread. For Exponential and Rayleigh distributions it corresponds to the standard distribution. For the Uniform distribution it has no effect. Clip Limit: This variable (between 0 and 1) controls the amount of histogram equalization that is to be applied to each patch. A value of zero means no histogram equalization. Unsharp masking boosts the high frequencies in an image by a factor proportional to the Gain. The high frequency in the image is obtained by subtracting from the image a low frequency version of it. The low frequency image is obtained by convolving the original image with a Gaussian of radius R. Thus R is the radius of the Gaussian and Gain is a multiplicative factor that enhances the high frequencies. Higher Gain implies enhanced edges — and noise, since noise is high frequency.